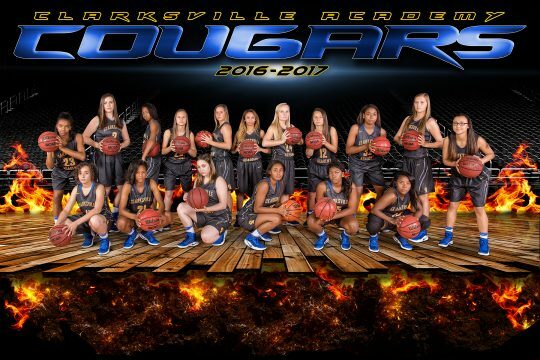 The Clarksville Academy Lady Cougars Varsity Basketball team has recorded many firsts this year. They successfully launched a JV program for the first time in school history. They are currently tied for first place in the District. They have an 9-7 record in overall game play with a 7-1 district record and still have ten regular season games left in the season. Success like this doesn’t happen overnight. This group of young ladies has consistently worked toward improving their team and they are reaping the fruits of their labor. It has required commitment. Some teammates arrive at CA as early as 6:00 a.m. to get in shooting time. Others spend long hours in fitness classes improving their overall strength. Coach Carrie Daniels has played a key role in that success. Since her arrival two seasons ago, she has transformed our girls basketball program. Her collegiate coaching experience and passion for the game is a perfect fit for the Cougar program. “After spending nineteen years at the collegiate level, I have to admit, transitioning to high school made me a little apprehensive at first. It wasn’t that I questioned my ability. I knew I understood the game and had the experience to lead the team; it was more the unknown. The college game was all I had done for nineteen years. After coaching here two seasons, I honestly can’t see myself anywhere else” Coach Daniels stated. Coach Daniels’ drive to see each girl improve and be passionate about basketball is what turned a corner for the Cougar program. Athletic Director, Jake Peterson said, “Winning is about so much more than points on the board. It’s about believing in yourself, practice, focus, determination, and a true team spirit. The Lady Cougars have found that.” This year there was an increase in the number of girls who tried out for varsity. This allowed them to form the first ever JV team in CA history. Increased numbers also brought on healthy competition between teammates and encouraged each player to work harder for her playing time. But, the biggest change, and most important change is that these girls want to win, and they believe they can. They put in the work, the practice, the training to become better, stronger players and in turn are winners. The Lady Cougars are improving each week with every game. They don’t back down from any challenge Coach Daniels and her staff present. Mandatory strength training workouts, weight lifting, running, and skill drills are all part of the process. Just as important, the girls are spending time together off the court and that is affecting their effectiveness on it. The team bonding and sense of team pride have played vital roles in their success. Freshman starter, Sydneey Boykin is the current leading scorer for the Academy and is ranked in the Top 5 in the state for steals. Boykin has the capacity of Division 1 level play, and she will continue to improve and mature during the next three years. Keisha Phillips, a Junior, is also new to the Cougar team. Keisha leads rebounding and has completed several double-double games this season. (double digit scoring and double digit rebounds) Phillips was named to Hall’s Sgt. York Holiday-All Tournament Team in Jamestown, TN this past December. Phillips has the talent to play ball on the collegiate level and will only grow. “I could not be more proud to be the coach of these ladies wearing blue and gold. When they step out on that court, it may not always be perfect and go according to plan, but the one thing I know is they are going to give us effort and that’s one thing you can’t coach” Daniels stated. Passion, determination, grit and a will to see this team go further than any other in the school’s history is what makes the Lady Cougars the team to watch this season!